Step Away From the Cake: Totally unrelated to anything important. Totally unrelated to anything important. I've been very busy this morning. I ended up going for my run. Yea Me!!! I did 4 miles in 1 hour. I was going real slow because of my back and from my house to the 2 mile mark is completely uphill. So I was slow but it felt really good and my back felt awesome. I had picked up new insoles yesterday and they made a HUGE difference. So that was all good. Xena's cage is in my computer room. As you may guess, with birds you get ants. She throws food all over the place and no matter how many times a day I clean I always miss some. I move her cage every night and sweep under it but still, there's ants. So today I decided to put her out in the living room, clean around her cage, and spray for ants. Now she has never spent much time in the living room. It's only the past week or so that we can pick her up easily. So I put her in the living room on her play set. She immediately gets down on the floor and runs to the full length mirror I have on the wall by the bathroom. She just has to look at that attractive bird. 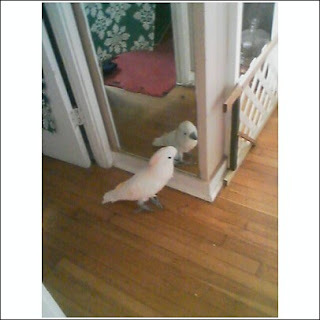 Who is that good looking creature??? Oh, look what's laying on the floor. How convenient, something to play with. Come on bird, let's play. 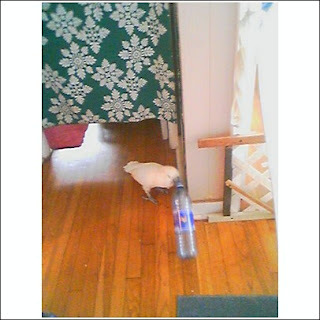 She then spent the next hour tossing that giant bottle at the bird in the mirror then chasing the bottle all over the house. It was pretty funny to watch. So while she was occupied I got the house cleaned and her room sprayed. It was a good day. So the other day I was talking about moving to Boston. Yesterday hubby and I were talking about an Orlando vacation home. We have friends all over Florida and just found out that one of them is back in Orlando. Who knows exactly what we will end up doing?? We are clearing up debts this year and then next year it will be decision time.